Ponneri - The Complete Travel Guide to Ponneri Taluk of Thiruvallur Dist. Here is the comprehensive map of Ponneri. In this map you will see the complete list of all the places situated in Ponneri Taluk of Thiruvallur Districk in Tamilnadu. This below map of Ponneri Taluk build with the help of Google Maps. If you want to view in large. Please click the below link of Google Maps of Ponneri. After Indian government announced Ponneri to become a Smart City. Land rates here in Ponneri increased by 20%. Real-estate people especially Plot Promoters, Land Owners and Real estate Agents showing more interest in purchasing and selling lands here in ponneri. Market Value and Guideline Value increased more than 50% in some areas of Ponneri. But still our Thanigai Estate offers plots in Ponneri – Pazhaverkadu for Just Rs.225/- per square feet. This is just amazing to watch. In Pazhaverkadu plots are at present selling at Rs.350/- and Rs.400/- per Square Feet in near by areas. Plot promotors not selling their plots below Rs.350/- and Rs.400/- . Thanigai Estate is the only company selling plots for just Rs.225/-. Daily around 50 to 100 people come to the office and book the plots. People who already visited the Pazhaverkadu site, booking their plots in bulk. Minimum they are booking at 2 grounds to 4 grounds. It is around 2400 square feet and above. So this is going to increase day by day when the smart city project starts. We’re expecting this project going to start before the end of this year 2015.Ponneri Plots – Behind Velammal International School for Just Rs.400/- per square feet. Ponneri is a taluk situated near to north Chennai and it is part of Tiruvallur district of the Indian state of Tamil Nadu. Now Indian Government announced Ponneri all set to become a smart city soon. If you want to know about Ponneri Smart City project you can read in this article. There are 146 places located in the Ponneri Taluk of Thiruvallur Districk. Here is the complete list of places in Ponneri Taluk. There are 9 places located in Ponneri Taluk with same pincode. The pincode for all the places below located in Ponneri is 601204. Here is the comprehensive list of Ponneri Temples. Ponneri has an ancient temple for Lord Shiva by which is said to be over 2500 years old. Nelluraman Temple(2 km from Ponneri). There are 26 top educational institutions located in Ponneri. Here is the complete list of Ponneri City Educational Institutions. Bharathy Nursery and Primary School. Dr.V.Genguswamy Naidu Matriculation School, Ponneri. Vishwa Nursery and Primary School, Ponneri. Scope Education Institute, Murugan Koil Street, Near Balaji Cafe, (Opp. Ponneri Telephone Exchange) Ponneri. There are so many buses operating from Chennai to Ponneri. So traveling is not a problem here. Here is the complete list of buses traveling from different parts of Chennai to Ponneri and Pazhaverkadu (Pulicat). Redhills, thatchur, rettambedu, Pattupalli(பட்டுப்பள்ளி சந்திப்புச்சாலை), Seganyam, devambattu. Train Route From Chennai Central to Ponneri. Note : All trains passes through Ponneri Railway Station halt in Ponneri Both local trains and long-distance trains stops in Ponneri Railway Station. Here is the complete list of railway stations between Chennai Central Railway Station to Ponneri Railway Station. We have also given extended list train passing via Ponneri Railway Station. This train timings updated every 15 days. Train Codes : GPD – Gummidipundi / PON – Ponneri / MAS – Madras Central Station. There are 25 trains from Ponneri Railway Station to Chennai Central Railway Station daily. I give the complete list of trains and its timings here. Here is the complete details about the project. CMDA is planning the development of Outer Ring Road (ORR) along the periphery of Chennai Metropolitan Area (CMA) with the objective of relieving the congestion within the city and also for catalysing the even dispersal of urban growth. ORR connects NH45 at Vandalur, NH4 at Nazarathpet, NH 205 at Nemilichery, NH5 at Nallur and TPP road at Minjur and is of length 62.0 km. The configuration of the alignment comprises of dual system of both road and rail corridor in a width of 72m. 50m. wide portion of land is reserved for future developments. The estimated project cost is about Rs.1081.40 crores. Land Acquisition has been taken up in two phases. The first phase of land Acquisition from NH 45 to NH 205 for a length of 29.2 km. covering 29 villages has been completed and possession taken over by CMDA. The second phase of acquisition from NH 205 to TPP Road covering 27 villages is under progress. The Government in G.O.Ms.No.200, Highways & Minor Ports (HF2) Dept., dt.08.10.09 have approved the revised administrative sanction for the implementation of the first phase of the ORR from NH 45 (Vandalur) to NH 205 (Nemilichery) for a distance of about 30 km, facilitating six lane traffic at a cost of Rs.1081.40 cr. under BOT-Annuity basis. The Tamil Nadu Road Development Company (TNRDC) has been appointed as the Managing Associate for the project to monitor and co-ordinate the implementation of the project on behalf of Government of Tamil Nadu. The work has been awarded to M/s GMR Chennai Outer Ring Road Private Ltd., for executing the project in two and half years. Execution of the project had since commenced. Above Paragraphs Content Source : CMDA Site. At present Thanigai Estate have 4 layouts in Ponneri. Share this post with your friends on Facebook, Google+ and Twitter so that they can also get the details about Ponneri and Ponneri Plots. 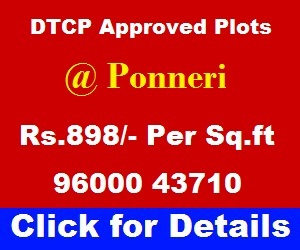 If you want to buy DTCP and Approved Plots in Ponneri. Please call me at this phone number R.K.Kumar 9600043710.